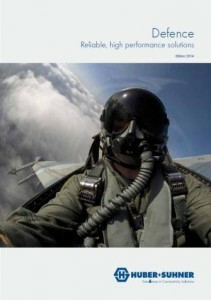 HUBER+SUHNER is pleased to announce the updated defence market brochure. The brochure provides a brief overview of the products in function of the different defence applications (aircraft, radar and so on). – Applications: providing a short description about the application, including heritage and main benefits. Additionally, a first recommended set of products is shown. – Products: the most important products are listed and the main selection criterias shall help to make an initial decision on the vast product range H+S has to offer. – RF cable selection guide: the last page reveils its power when unfolded. It offers a great overview about H+S most important RF/MW cables.